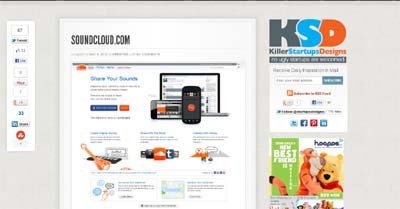 Features the best startups designs online the web. Visitors can vote a using the killer vote tool and express their love for the design. Only ONE carefully hand picked startup is featured daily and stays on the home page taking most of real estate of the site for the first 24 hours and will get maximum exposure. Plus will get posted on tumblr, will tweeted and pinned on pinterest. Then it will move to the recent post section and will stay there for weeks. We only feature the best of the best startup designs. Because our philosophy is a well thought design will create a well thought product.